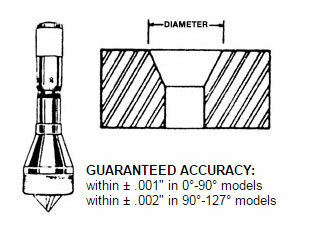 The BARCOR CHAMFER GAGE is a precision instrument specifically designed to measure the top (major) diameter of a chamfer, countersink, center drill, or tapered hole. Just press the spring loaded, conically ground, precision 3-blade Gaging Plunger into the chamfer or countersink and instantly read the dial in .001" or .01mm/.02mm diameter increments. The BARCOR CHAMFER GAGE is a direct reading instrument. The Barcor Chamfer gage does not require a setting master or standard. To "Zero" the gage or check the setting, press the base of the gage against flat ground surface and adjust the dial to read the "Set To" number stamped on the back. 90° - 127° for angles greater than 90° but less than 127°. Models for angles larger than 127° can be priced on request. Models, HALF SIZE Models, Electronic Models with SPC capabilities, Masters with long form calibration traceable to N.I.S.T.. The chamfer gage is ideal for measuring chamfers in piston rings, shaft centers, bushings, stampings, valve seats, rivet seats and tube flares, hydraulic fittings, and screw machine parts.